China's Belt and Road Initiative is expected to tighten connections between Asia-Pacific economies and explore new growth engines in supporting a more open regional market, according to officials and experts at the 25th Asia-Pacific Economic Cooperation Economic Leaders' Meeting in Da Nang, Vietnam. Unprecedented opportunities for regional cooperation will emerge as the Belt and Road Initiative takes shape, and this is expected to stimulate cooperative partnerships among the APEC member economies, Zhang Jun, head of the Chinese Foreign Ministry's International Economics Department, said on Saturday at a news conference in Da Nang. The Belt and Road Initiative has been praised by many senior government officials and business executives of APEC member economies at the Vietnamese coastal city, who say it is an innovative, significant contribution to global economic development. Jin Liqun, president of the Asian Infrastructure Investment Bank, said at the APEC CEO Summit that the bank, as a fundraiser for Belt and Road projects, will proactively support infrastructure construction in Asia-Pacific economies, aiding regional connection and advancing inclusive economic growth. The region's infrastructure needs have never been satisfied, and these needs are growing rapidly, especially for airports, harbors and roads in the second-and third-tier cities, Jin said. 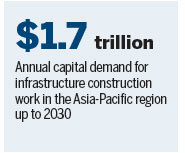 An Asia Development Bank report forecasts capital demand for infrastructure construction work in the Asia-Pacific at $1.7 trillion annually up to 2030. "The region's development could be constrained by a bottleneck if the gap in infrastructure investment cannot be resolved," though APEC economies have quickly developed in the past four decades, Jin said. The AIIB has run projects with coordination provided by APEC members, including the Philippines and Indonesia. China APEC Development Council Chairman Zhang Lijun told China Daily that the Belt and Road Initiative has extended APEC's experience of members' cooperating on free trade and investment into broader regions. "The initiative is also expanding economic and technological cooperation in the APEC region, especially in the planning of infrastructure construction, technology standards and the connection of transportation, energy and telecommunication networks. This will reduce the development gap between member economies while achieving sustainable development," Zhang said. He suggested that the Belt and Road Initiative be taken as a part of the APEC framework, based on a "mutual benefit and win-win" cooperation model to advance regional economic integrity. The Chinese delegation at this year's APEC meeting reiterated that promoting more inclusive free trade cooperation in the Asia-Pacific region remains a top priority, and the notion of the "Free Trade Area of the Asia-Pacific", first brought to the table by China, has been increasingly accepted as an ideal model for boosting trade and regional integration. In order to advance the FTAAP process, a road map was sketched out by APEC member economies at their 2014 meeting in Beijing. As experts said, the Belt and Road Initiative can provide strong support on the FTAAP in building infrastructure and policy and fundraising cooperation as well as boost an inclusive, integral development.